So many times I had the temptation to start a topic in TL's forum, yet I felt I am not worthy as a poor platinum player. And today, I have discovered the blogs section, where I can, apparently, make my mind free of all my SC2 thougths that have been weighing it down for so long. So let's get starte with a nice little graph. I have already played more than 200 1v1s since I started to save all my replays and I have become quite obsessed with looking at them through sc2gears as "data" (maybe it has to do with me being a physicist? I don't know ). One thing that struck me early was that my APM is 68. Or 67, maybe 70. But its incredibly stable. It does not rise, it fluctuates minimally game to game, its almost amazing. Shouldn't I become a drummer? I apparently have a hidden sense for rythm! Probably even more suprising was the discovery, that most of my oponents are significantly faster. In the sequence of players from my replays, ordered by APM, I am at the edge of the bottommost 25 %. Yet I am getting a consistent win ratio slightly over 50 percent, as expected given the matchmaking algortihm (and me hopefully slightly improving over time, as I was promoted from gold to platinum during this period). 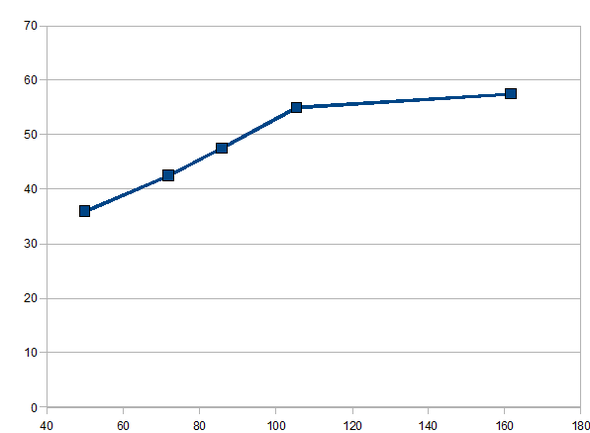 So I played with the numbers a little bit more and greated the not-so-neat graph above. My 205 oponents were split into 5 equal bins in APM. The X-axis then shows the middle of each bin (the rightmost bin being the largest as there are even 3 >200 APM people in my replay pack (and I beat 2 of them!)) and the Y-axis the win ratio of my oponents in the bin. (I tried with higher number of bins, but the data is too noisy). The outcome is: APM indeed matters, but not to an extend some people are advertising. I have much easier time beating people below my APM, but even for people with twice as many actions per minute than I have, I can mantain a win ratio of 43 %. The question is: why do these people do wrong? Why do they spam so many actions, when they apparently do not contribute to their success? A lot of people just mimic things they see pros doing without thinking about it on their own, so that's part of it. It's not surprising that APM is correlated with skill though. Clearly, as one improves, their APM will go up, since they are accomplishing more tasks in a shorter period of time. However, this also doesn't take into account a particular person's efficiency. Some people have 70 APM but accomplish as much as someone else with 120 APM. I think people rarely ever become so much more efficient that their APM drops, though, they just use the extra APM cleared up by being more efficient to do even more stuff. My friend who is diamond has a much higher APM than I do (I'm masters). I was blown away when in a game we played, he had 170 average APM compared to my 125. Then, I watched him play. He clicks completely excessively. Most of his APM comes from rapid mouse clicking. I told him that if he wanted to get to masters, he needed to stop clicking so much and focus on more important things. Well I don't play sc2, but I assume the same logic from bw would probably apply. Either, said people are not being efficient with their actions, eg spamming or performing lots of unnecessary actions, or just be playing in a much more micro intensive style. Or, as is generally the case when your at some midling ranking, it's because people have been promoted to that ranking for different reasons. Everyone has their strength and weaknesses, I would assume your generally better at decision making, or game sense or choose more appropriate builds for the map than other people around your ranking, while some of them may be there primarily from having better mechanics mechanics. In other words they genuinely have better mechanics than you, but you make up for it with better decision making or something. Theres a recent replay of a silver guy asking for help. Dude had 250apm from spam clicking but he does things like forget to put drones on gas on his first extractor. High apm is good to have if its useful but if it's just spam clicking its a waste and detracts from things you should be doing. APM is tricky, while higher effective APM is obviously helpful, even low APM can get you to a relatively high level of play (I have seen several masters with sub 100 APM). I am mid-high diamond and my APM is between about 68-75 (going up with game length) each game with little to no variation, yet I play people who have twice that but seem less effective at multitasking. I wish there was some way of measuring effective APM vs. spam, as it would probably cause a lot of the spammers out there to cut down on their useless clicking which one would assume would help raise their level of play. Or does spamming so much actually help? 1400point Zerg masters here with like 60apm. I hotkey everything so I don't switch things much. It's the popular concensus that there is a threshold apm of around 80-90 where you can accomplish just about everything you need to at a high level. Anything over that can be attributed to spamming, the act of telling yourself you are doing more or playing faster by clicking more than you need to or trying to keep your apm high because you feel more comfortable clicking at the same pace throughout the game, regardless of how many tasks you actually have at hand. Right from the start of the game, if you just rallied your workers to mine and didn't consciously mineral stack, you'd only have about 20 real apm. But most players find that sluggish and unamusing so they will spam hotkeys or click excessively to keep themselves focused. In terms of lower league play, 30-60 is sufficient, as in there are only so many meaningful tasks within one's grasp to accomplish. As you get higher in rank, you must constantly keep tabs on your enemy's army movement, composition, size, economy timing, economy saturation and tech. Scouting becomes more important at a higher level and I find that the better I get at the game, the more attention actions I devote to scouting. Other than scouting, when you are doing tasks such as building workers, buildings and units, a very low amount of apm is necessary. But when you incorporate scouting, you need to know where you must position your army and how to align it and this requires significantly more actions. I "spam select" my buildings to check timings on build completion, it's completely standard and most people do it. oh my god, the most hillarious brit ever is in my thread! i did not mean to criticize your play. If youu can do it naturally, then it is probably good for you. on the other hand, you obviously miss other things you should be doing (supplies, army control), so it looks to an external observer as that it may take too much of your time. I know that every pro does it exactly this way. My point was that you people copy it without being actually able to benefit from it. Anyway, you manage to play while constantly talking and being hillarious, i definitely admire that! Diamond protoss here and I average somewhere between 90 and 100 APM. It's never higher or lower. I generally try to make any clicking or mouse movements accurate rather than spamming and use hotkeys for nearly everything. You really do search for every mention of your name, don't you? It is strange how you can get into a rhythm and have very close APM's for two very different games. It's far better to have great game sense and poor APM than to have great APM and poor game sense. APM just isn't a very good metric of a lot of things. i also use sc2gears, but not to look up my or my opponents apm. i watch the hotkey setups and if i face a zerg player i look up how big his injection gaps were. this tells much more about a player imo. i dont know if it is possible to watch the average energy of oc's and nexus, would also be interesting. u can see at the hotkeysetup if he is just a apm spammer or if he uses his clicks efficent imo. I play in mid-high masters(though I've been on a forced hiatus for a while) with average 75 apm. I do feel too slow in some areas of the game, am working on speed. Skill and apm often raise together, but apm is a poor estimate of skill IMO. That is actually quite encouraging for me to read!